David Lynch and Mark Frost’s early ’90s series Twin Peaks remains one of TV’s unlikeliest touchstones, an oneiric soap opera—set in a supernatural small-town Pacific Northwest—that is equal parts lurid and golly-gee wholesome. 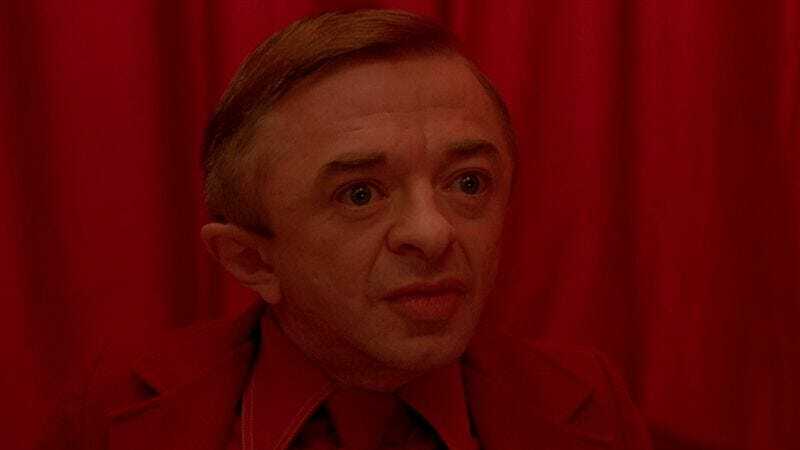 This comprehensive Blu-ray collection includes every episode—both the American pilot and the longer European version—and Lynch’s 1992 spin-off feature Twin Peaks: Fire Walk With Me. As with Lynch’s earlier 10-disc Lime Green set, there’s also a plethora of material pulled from the tsunami-haired filmmaker’s personal vault, including 90 minutes of Fire Walk With Me deleted scenes. Lynch is effectively retired from filmmaking; the in-character cast interviews he filmed for this release amount to the most substantial new directing work he’s done since Inland Empire. Lynch’s fan base has a substantial overlap with the cult of Werner Herzog, and those in the middle of that particular Venn diagram will probably have a hard time deciding between The Entire Mystery and Herzog: The Collection. The 13-disc set includes the first Stateside Blu-ray releases of most of the sonorous German’s best-known films, including Even Dwarfs Started Small, The Enigma Of Kaspar Hauser, Heart Of Glass, Stroszek, Woyzeck, Nosferatu The Vampyre, Fitzcarraldo, Cobra Verde, Lessons Of Darkness, My Best Fiend, Little Dieter Needs To Fly, and Aguirre, The Wrath Of God. Whew. Extraneous sapphic overtones, flashbacks to the Middle Ages, jerky slow zooms, references to the Knight Templar—anyone whose lizard brain perks up at the prospect of seeing one or all of these things within the context of a horror movie should consider picking up The Complete Blind Dead Saga (Blue Underground). Though one would be hard pressed to make a case for Amando De Ossorio as a great (or even consistently competent) filmmaker, this four film cycle—consisting of Tombs Of The Blind Dead, Return Of The Evil Dead, The Ghost Galleon, and Night Of The Seagulls—isn’t without its pleasures. Speaking of directors without much in the way of a critical reputation: Kino Lorber is following up last week’s Billy Wilder double-whammy with two films by Delbert Mann, the “most lesser” of ’50s Hollywood’s three unrelated Manns. (The others being Anthony Mann and Daniel Mann, natch.) Mann’s 1955 debut, Marty, won both the Palme D’Or and the Academy Award for Best Picture; those wondering why it’s better remembered for its lead performance (a career-making turn from Ernest Borgnine) and script than for its direction should look no further than Mann’s stiff-as-a-board Terence Rattigan adaptation Separate Tables. Because no week would be complete without Kino putting out a few more minor films from the twilight years of the studio system, the label is also releasing Duel At Diablo and Paris Blues. Both films star Sidney Poitier; the latter—a typically well-intentioned effort from old-school liberal Martin Ritt—features an effective Duke Ellington score and a Louis Armstrong cameo that suggests Satchmo could have easily made a career as a character actor. Having already released James L. Brooks’ Broadcast News, the nation’s most respected home video label continues to make inroads in the baby boomer market by putting out Lawrence Kasdan’s The Big Chill (Criterion). The three-disc, dual-format set—mastered from a brand spankin’ new 4K transfer—includes an essay by Lena Dunham and will hopefully pay for some nice Jacques Rivette Blu-rays. Those looking for definitive proof that the past is truly a foreign country might want to take a look at Aloha, Bobby And Rose (Shout! Factory), one of the highest-grossing films of 1975. The second feature by Floyd Mutrux—who directed Dusty And Sweets McGee, wrote Freebie And The Bean and The Christian Licorice Store, and basically cornered the market on the kind of unappealing movie titles that could only fly in the ’70s—is a lugubrious super-low-budget road movie that probably works best if you’re stoned, making out at a drive-in, or both. To be perfectly honest, this isn’t a great week for new releases. However, if there’s any movie that’s worth catching up with, it’s Darren Aronofsky’s flawed, fitfully fascinating midrash blockbuster. The film’s scattershot first half plays like bargain-bin Lord Of The Rings, but the movie finds its shape—and purpose—once the floodwaters rise and the action shifts to the interior of the ark. Here, Aronofsky turns the story of the flood into a somewhat demented psychodrama, set in a world where God is irrefutably real but also completely unknowable. Our own A.A. Dowd gave it a B-. The late Vivian Maier—an extremely gifted, prolific Chicago street photographer whose work was only discovered after her death—has become something of a human interest story gold mine, providing fodder for countless articles, TV pieces, radio segments, and slideshows. Anyone who hasn’t heard her story yet—or would prefer to hear it in something like a definitive version—might want to check out Finding Vivian Maier (MPI), the Kickstarter-funded documentary that played a key role in stoking interest in Maier’s work. The week’s other major studio release is Nick Cassavetes’ The Other Woman (20th Century Fox), which—along with Tony Jaa’s comeback vehicle The Protector 2 (Magnolia)—is a must-have for anyone who wants to see unnecessary, unconvincing CGI in the comfort of their home. From the smaller distributors, the Catherine Deneuve road trip movie On My Way (Cohen), is joined by a slew of titles which were neither widely seen nor well-received: the Nick Frost vehicle Cuban Fury (Entertainment One), Lullaby (Arc), and the adaptation of Chimamanda Ngozi Adichie’s Half Of A Yellow Sun (Monterey). Anyone who considers Superbabies: Baby Geniuses 2 to be the low point of Jon Voight’s career has obviously underestimated the depths to which the Oscar winner and three-time nominee will sink for a paycheck, which includes—but is not limited to—appearing in direct-to-video sequels to the aforementioned film. The latest, Baby Geniuses And The Treasures Of Egypt (Crystal Sky), drops today, preceded by a nightmarish trailer that features Tim And Eric-level compositing effects, diaper jokes, and glimpses of Voight in yellowface and brownface. The next installment in the franchise, Baby Geniuses And The Space Baby, is due later this year.